Pot Shots and Panic Attacks! If you pay any attention to the cannabis markets, you saw a Category 5 sh*tstorm this week. And sure, I could spell that without the asterisk thanks to the trailblazing work of German Chancellor Angela Merkel, but I’ve been told to watch my language. And let me tell you, buckaroo, the action in one particular pot stock calls for language so salty you could float a battleship! Charges of hoodwinking, fraud and flim-flammery were leveled. They were denied. Counter-charges of not knowing a darned thing — of having a giant, yawning void between the ears — were fired back! The bottom line is that one of Canada’s top cannabis darlings is either a funnel of incredible fraud, a veritable hootenanny of hoodwinking, or someone has made an error that is going to land them in legal hot water for a very long time. Indeed, whoever is wrong on this had better lawyer up. The stock I’m talking about is Aphria (NYSE: APHA). Now, my subscribers are familiar with Aphria. In January, members of my marijuana publication (which closed after helping them rake in a big ol’ pile of money) banked big gains on this stock. One subscriber told me he banked 158% on the stock in a matter of weeks. Wham, bam, thank you ma’am! Oh, man, that is a tough couple of days. Selling was fast and furious, and on “head for the hills” trading volume. The match for this powder keg was a report from Quintessential Capital Management, with help from Hindenburg Research. Very bluntly, it claims that Aphria is paying way too much for overseas assets owned by the company’s own insiders. And the report names some of the insiders it says benefited. That was Monday. On Tuesday, Aphria responded. I would describe its response as “tepid.” And so, the stock took another nosedive. Hindenburg hit again, noting that Aphria did not answer many of the major issues raised in the report. I should point out, by the way, that both Hindenburg and Quintessential are aiming to make money from the plunge in Aphria’s stock. And on Twitter — because that’s where public debate takes place now — many posters said the short-sellers were overstating their case. Separately, Canaccord Genuity voiced its opinion that Aphria was still worth C$12.90 per share (US$9.65) based on its Canadian assets alone. Canaccord lowered its price target on Aphria — to C$18 per share. The real return punch came from financial website Grizzle. It pointed out that Aphria has C$314 million in cash in the bank, and that Aphria says it will harvest 255,000 kilograms of cannabis a quarter by this time next year. As a result, Grizzle gives Aphria a C$20 valuation. Or US$15 per share. And I should also point out that Grizzle has, in the past, called the cannabis sector very overvalued. 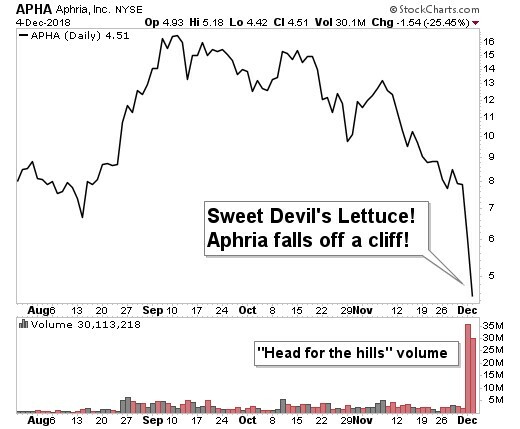 After this steep sell-off, Aphria may be a bargain. This assumes that its existing Canadian pot business isn’t going to go up in smoke. The management of Aphria and its subsidiaries is secretive and potentially shady. Hindenberg is right when it says we can’t know who owns or profited from these sales of companies and their assets. From the outside, it’s really quite murky. It’s never a good sign when a company’s office is in an abandoned building. Seriously? It sure looks like Aphria overpaid for its overseas assets. In its defense, Aphria says, basically, that when the great marijuana rush was going on, everybody overpaid. That’s a fair point. But not one I would rest my case on if I were trying to defend company value. My main concern is that, IF Aphria management is as self-serving as Hindenberg says it is, then it will have trouble attracting investor capital. And if there are other choices on the table, I would pass over Aphria to choose another. That doesn’t mean the stock can’t go up from here. It sure can. Oh boy, it could rocket, especially if short-sellers (like Hindenberg) are forced to cover. On Twitter, we hear that Aphria insiders are buying. Well, looking at their past deals, they obviously aren’t good judges of value, are they? My real takeaway is that there MUST be a better way. That’s why I’m going to work with the Weiss team to come up with Weiss Ratings for cannabis stocks. It won’t be perfect. But it might be a lot better than what the market has now. I do think there is value in this industry. I also think it could get cheaper, as the fallout from the Aphria hullabaloo continues. But the day to buy bargains will come. Be ready for it. Because when this industry takes off, it can rocket. And the next countdown may be closer than many think. Where was your sell on APHA? Why does Schwab want you to call them directly to place orders for CWBHF? I’ve never seen that happen before.